Even as a small child, I wanted to help with our mealtime plans which also included setting the table. We always had a centerpiece and the knives, forks and spoons were exactly where they should be... as were the napkins. Mother used table cloths or seasonal place mats...we never ate on a bare table. I loved setting the table and would go out of my way to invent creative ways to fold the napkins. Imagine my delight when I actually found a napkin-folding how-to book at the library. Unfortunately, this table-setting trait did not pass on down to my own children. None of them cared if the tableware was in the correct place...and forget the napkin folding process...if I did not hand out the napkins, I am sure they all would have been just as happy to lick their fingers or wipe their hands on their pants! On the plus side, my cooking was well appreciated and our family dinners together each day more than made up for the lack of table-setting enthusiasm. As an empty-nester, I no longer care about the fold of my napkins, but do care where my fork is placed; I still love to cook, but have fixed some very strange meals for myself when my husband is out of town. Suffice it to say, it is a lot more fun to plan meals when more than one person is home. On the plus side, however, these solo days give me more chances to fix something only I love to eat. Today's recipe is one of those. I had forgotten how much I loved mussels until recently when I saw them at a store and, on impulse, bought some. Two vacuum-sealed bags were in the package, but no real directions were included for their preparation. Nothing in my library of cookbooks helped, either...so, I assumed I could go to the internet and Google for directions. I did not find what I wanted and instead, found a lot of opinions about how the only good mussel was a fresh one. So, there I was with two bags of frozen mussels that I did not know how to pepare and, if I somehow did figure out what to do with them, was guaranteed by those internet folks to hate them. With nothing to lose, though, I tried what I thought would work...and surprise...it was easy and they were wonderful. To top it off, all of the shells opened...which is the way to tell if a mussel is edible. Bags of mussels all for me...yum! One serving: Remove one bag of mussels from 2-bag package. 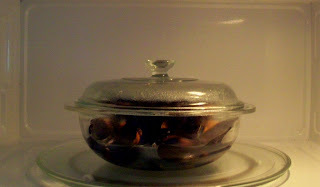 Cut open the bag and pour the frozen mussels into a glass bowl with a lid. Add 1 1/2 cups of water to the bowl and cover it with a lid. Place the bowl in the microwave and cook on HIGH for 3 minutes. (If your microwave does not have a turntable, rotate the bowl halfway by hand after 90 seconds; replace lid and continue cooking). After 3 minutes, carefully remove lid and gently move mussels around with a spoon. Replace lid and microwave on HIGH for 1 minute more. 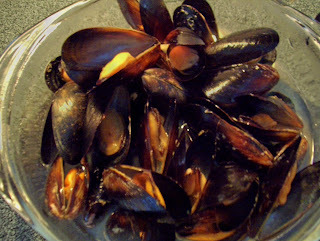 Remove the bowl from microwave and lift mussels to a plate with a slotted spoon. While mussels are cooking, heat desired amount of butter with pressed garlic until butter melts and garlic is tender and warm. Serve alongside mussels. Pick out each little mussel and dip in butter mixture. Enjoy! Optional: fresh lemon may also be added to garlic-butter.